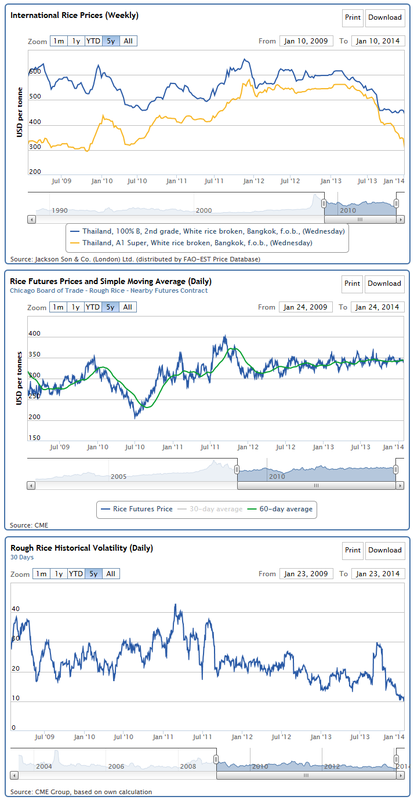 The International Grains Council’s charts for all grains and major traded grains. What is the connection between these charts and local food price inflation? 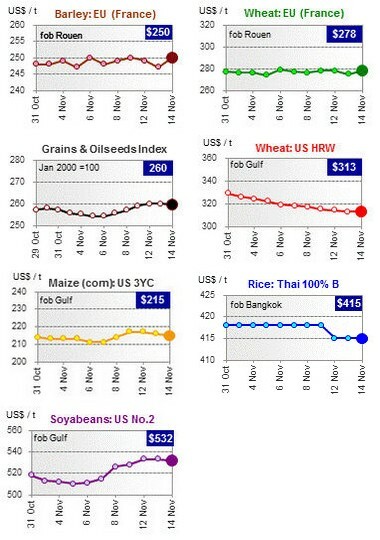 The International Grains Council’s monthly Grain Market Report for 2013 October finds its grains and oilseeds index down 16% from the same period a year ago because, as the IGC has said, “the supply outlook for grains, rice and oilseeds markets is significantly more comfortable than last year”. The IGC has raised the output forecast for total grains (wheat and coarse grains) in 2013-14 by 10 million tons this month, to 1,940 mt, up 8% from the same period last year. Demand is also expected to rise, but by a slower 5% compared to the same period a year ago. The IGC has said that “inventories are seen recovering by 39 mt to a four-year high at the end of 2013-14”. The global trade forecast is raised by 3 mt, to 273 mt, which will exceed the previous record in 2010-11. Hence the question ought to be: if the international trade in grain collects, moves and processes just under 15% of the world’s total grain, why do prices in our local wholesale and retail food markets get influenced so much by what the IGC’s monthly report describes? This is not an answer you can expect given to you with honesty and concern from your local administration, much less from the food retail and industrial agriculture representatives. For the major grains, here are the IGC summaries. Wheat output is expected to rise by 6% in 2013-14 from the level of a year ago and closing stocks are seen up by 7 mt, at 182mt, although this would still be below the level seen in 2011-12. The 2013-14 forecast for the global maize harvest has been raised by 5 mt this month to a record 948mt, and stocks are seen recovering to a 13-year high of 152 mt. 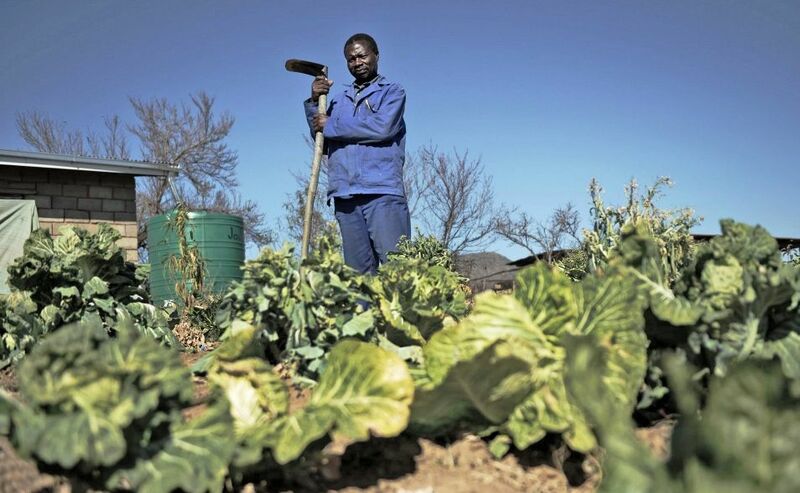 If global food indices are descending, why are local food prices rising? 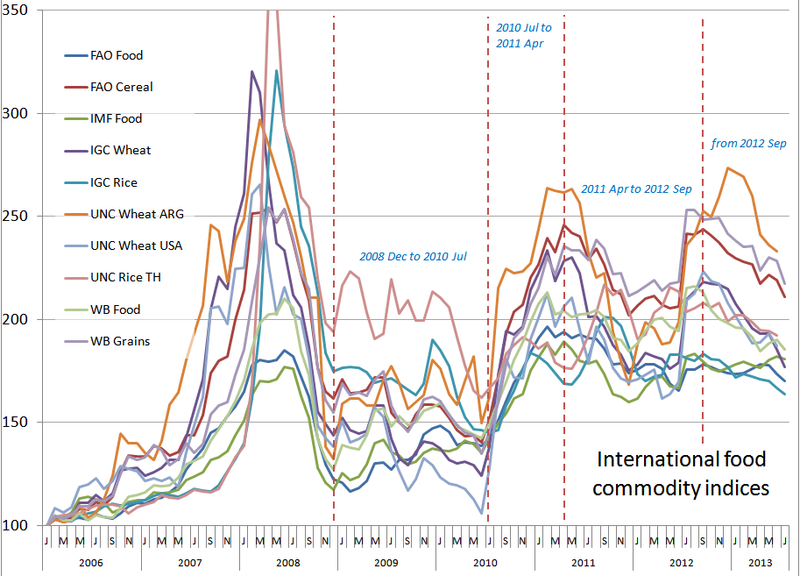 The trends of ten international food commodity indices from 2006 onwards. 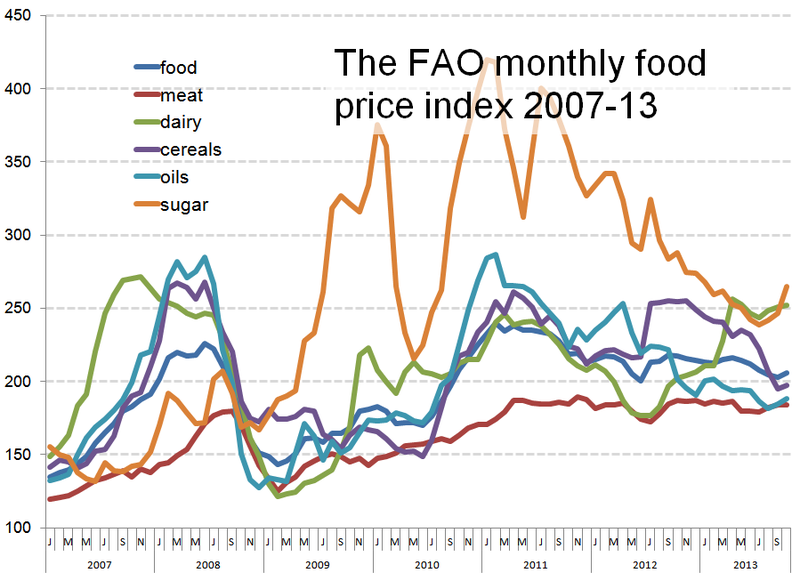 The main chart plots the course of the Food and Agriculture Organisation (FAO) Food Price Index and nine other international food price indices. 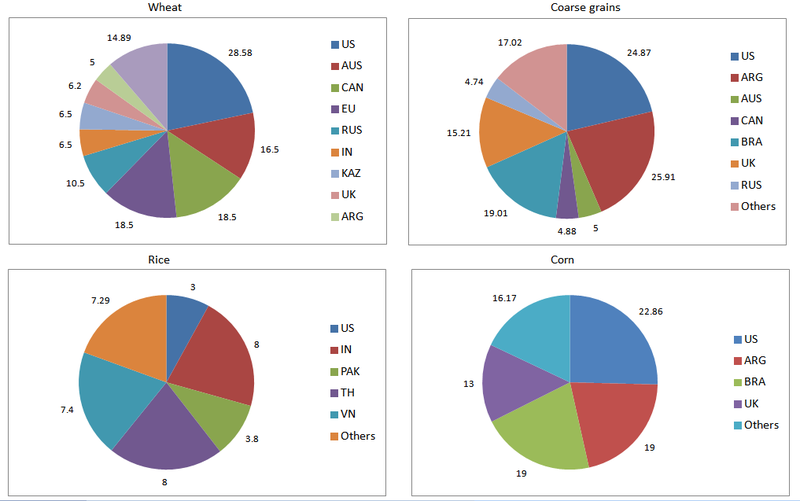 These are FAO’s cereals index, the International Monetary Fund’s (IMF) food index, the International Grains Council (IGC) wheat index, the IGC’s rice index, the UN Conference on Trade and Development’s (UNCTAD) two wheat indices, Unctad’s rice index, the World Bank’s (WB) food index and WB’s grains index. On the main chart, after 2008 December four stages are marked. The first stage is 2008 December to 2010 July, when the indices describe a plateau but which is very much higher than where they were through 2006. 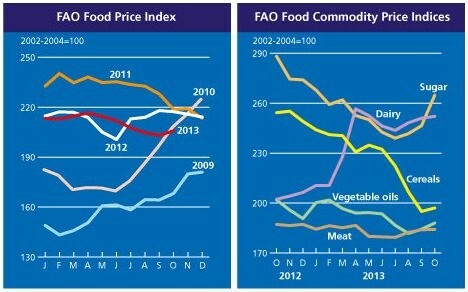 The second stage is 2010 July to 2011 April, which corresponds to the second global food price rise and when all these indices rose in concert. The third stage is 2011 April to 2012 September when they all declined to another plateau which nonetheless is higher overall than the last one (stage one), but which rose steeply for a short while towards the end of the stage. The fourth stage is still current, from 2012 June, which is seeing a gradual decline in all the indices to the point they were in 2011 August-September. I have appended to the main chart the counterpoint of the consumer price indexes from South Asian countries – Nepal, Sri Lanka, Bangladesh, Pakistan and India. The question that follows, when reading the main chart with ten indices and the CPI chart for South Asia, is why the CPI trends do not follow the international grains trends. One of the major factors (which charting this data cannot reveal, as the FAO Food Price Index does not) is the extent to which the industrialisation of prmary crops sets the retail price in the markets of Colombo or Chittagong or Karachi or Mumbai or Kathmandu. Primary crop – that is, cereals, pulses, fruit and vegetable, milk and dairy – is being moved internally, processed, packaged, moved again, retailed in modern convenience stores to a much greater degree than was the case a decade ago. Those costs lie outside what the FAO-IGC-IMF-Unctad-WB indices can describe. But we need to urgently – within these countries and as a group – share methods to gauge and monitor these costs and document their impacts on households. 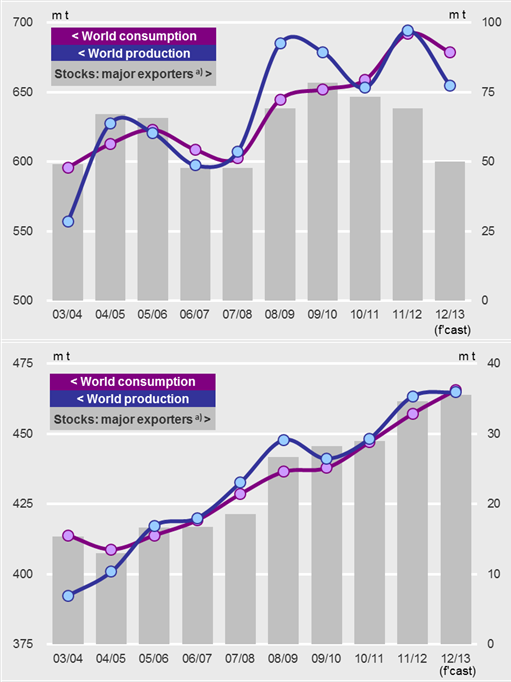 For its final Grain Market Report for 2012, the International Grains Council (IGC) has revised slightly its grains supply and demand forecasts for 2012-13 “as harvests have been completed in some countries, but the outlook is largely unchanged”. Total grains production is expected to fall by 5% year-on-year, said the Report for 2012 November, “and despite a contraction in consumption for the first time in 14 years, stocks are set to fall by 45mt to 324mt”. In the wheat market, the Report has said that speculation about dwindling Black Sea supplies and the prospect of export curbs in Ukraine have dominated, yet flows from the region have defied expectations. “This has limited price upside from weather-related worries for 2012-13 crops currently being harvested in the southern hemisphere, and conditions for the recently planted winter wheat in the north,” said the Report. Given high prices, the total wheat harvested area for 2013-14 is set to increase by 2%, although the IGC has warned that conditions for parts of the US crop are a concern. Maize prices outperformed other grains with improved US export hopes and less than favourable planting conditions for South American crops which are critical given tight supplies. In contrast, rice prices have been relatively stable, but Asian markets were pressured by new crop supplies and mostly limited activity. The UN Food and Agriculture Organisation’s (FAO) Agricultural Market Information System (AMIS for short, although whether it Francophonically proves to be an ‘ami’ of the cereal trader or the food consuming household we shall know in the months to come) has released its Market Monitor Number 3 which is for 2012 November. Two familiar blues and a new green. 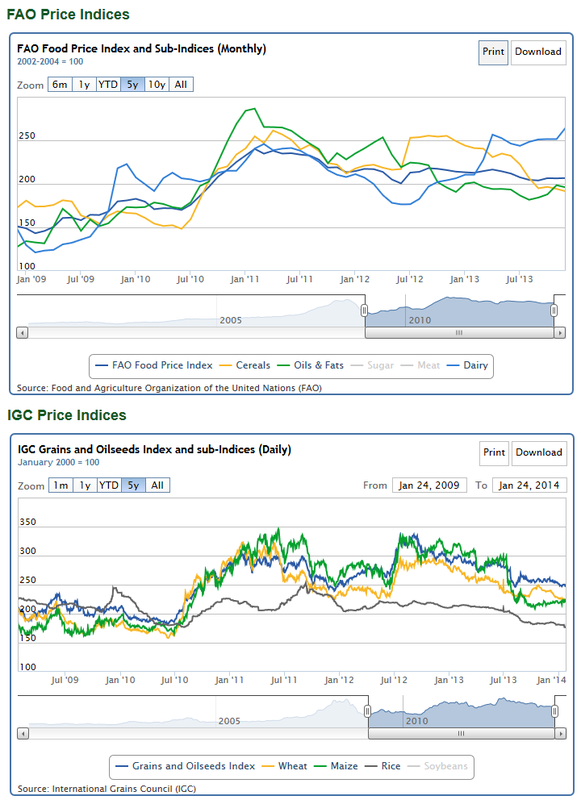 The IGC Commodity Price Indices chart in the company of the FAO’s Food Price and Food Commodity Price Indices charts. What I find useful is that the tables provided now include the USDA estimates and the IGC estimates. And moreover, in a generous display of collegial latitude (perhaps the AMIS has its good points after all) the Monitor has included the IGC index chart alongside the FAO index chart. But as the World Food Programme (WFP) tirelessly warns, From Africa and Asia to Latin America and the Near East, there are 870 million people in the world who do not get enough food to lead a normal, active life (see the WFP’s hunger map here in English, en français, en español. What does that do to households who are not the primary audience of the AMIS? This report from IRIN has said that now in Pakistan, more than half of households are food insecure, according to the last major national nutrition survey. The prices of staple grains like wheat and rice have been stable but are “significantly higher” than 2011, according to the World Food Programme’s (WFP) October 2012 Global Food Security Update. A 25% rise in fuel prices has also pushed up the price of food, as it becomes increasingly expensive to transport. WFP says rising food prices in international markets recently may also lead to price hikes in Pakistan. Clearly, we need to find a way to filter the AMIS outputs (or screen its inputs) so that the Monitors are more directly useful to houseolds and their struggle to find enough healthy food at affordable prices. 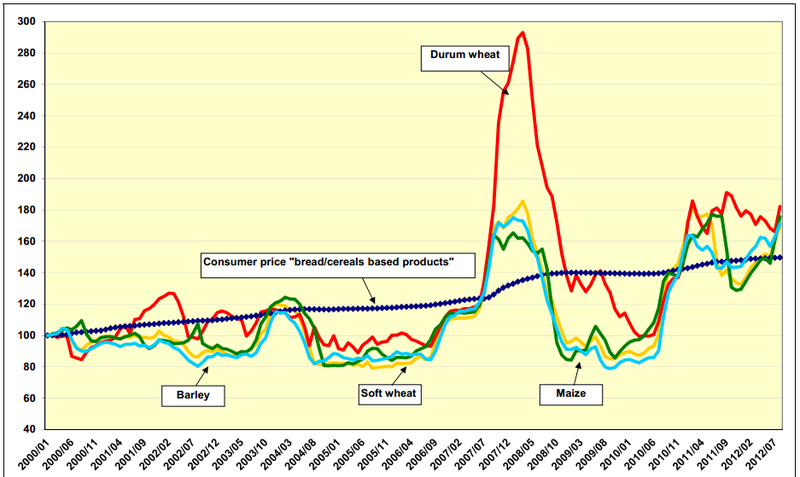 The European Commission’s directorate general of agriculture in its ‘Commodity Price Data’ 2012 August edition contains this chart on ‘cereals/bread and cereals-based products’ that their EU agricultural market and consumer price developments (this shows 2000 January to 2012 August data with the starting month representing the 100 of the index). This chart shows barley (the blue line) is at or near the 2007 peak and maize (the green line) is above the 2007 peak. The Grain Market Report for 2012 October released a few days ago by the International Grains Council (IGC) makes two extremely important prognoses. 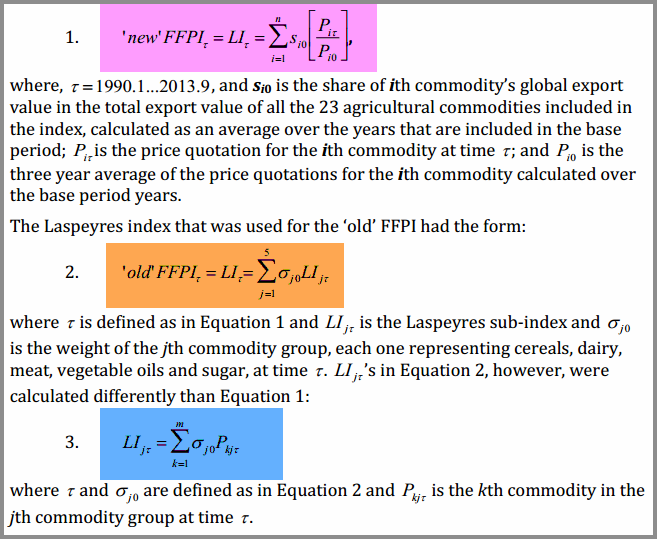 These two forecasts will have an immediate effect on grains prices as they are traded in the agricultural commodities markets through the winter season of 2012-13, and I expect we will see the effects in the major indices that describe the movements of food and of food prices – the FAO food price index, the World Bank ‘pink sheet’, the IMF commodity prices index, Unctad’s long-running series on agricultural commodities, and of course the various exchanges-based indices (DJ, CBOT, NYSE LIFFE and so on). 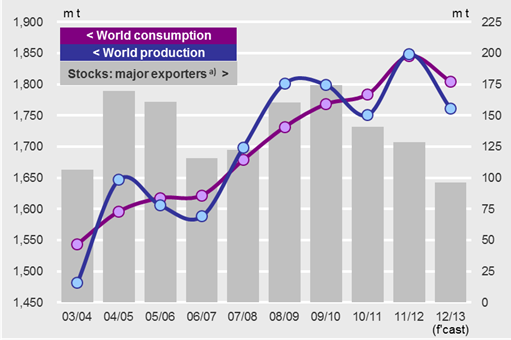 The IGC has cut a further 6 million tons (mt) from the 2012-13 forecast for total global grains production, which is now expected to be 5% lower year on year, at 1,761 mt. The decline includes 39 mt of wheat, 46 mt of maize, and 4 mt of barley. “Reduced availabilities and higher prices are expected to ration demand, resulting in the first year on year fall in grains consumption since 1998-99,” said the IGC in this month’s report. It is worth making the connection that the United States Department of Agriculture (USDA) in its recent ‘Wheat Outlook’, released on 2012 October 15 by the Economic Research Service, had said that global wheat production in 2012-13 is projected to reach 653.0 million tons, down 5.7 million tons this month (that is, 2012 October). The USDA’s 2012 October Wheat Outlook had said the “largest change this month is a 3.0-million-ton cut in projected wheat production in Australia to 23.0 million” and had added that “projected wheat production in Russia continues its decline as the wheat harvest gets closer to its end and projections for abandoned wheat area get higher, reaching 12% of planted area”. About the European Union (EU-27) wheat production for 2012-13 the USDA Wheat Outlook had reduced it 0.8 million tons to 131.6 mt, mostly because of a significant reduction for the United Kingdom (UK) (down 0.8 million tons to 14.0 million). The IGC forecasts show a further tightening in the balance this month, with 2012-13 end-season total grains stocks revised down by 4 mt to 328 mt (it was 372 mt the previous year), the lowest since 2007-08 – and we all remember well the global food price increases that set in during the 2007-08 season, and how the spikes of that period were quickly replaced from mid-2010 onwards by the sustained high plateau of food prices.